So what exactly do you need to have a record-breaking tweet? Glad you asked. Emotion. There is joy all over this snapshot. This may have been the most shared Vine of the evening and what’s happening? Happy people being happy dancing to a song called “Happy.” You engage people when you evoke feeling. Fun pics at a big event. Not every event is going to be the Academy Awards, but there are tons of other eye-catching ceremonies, galas, dinners, etc that happen throughout the year. Take some serious photos and mix in some candid ones. A good ask. 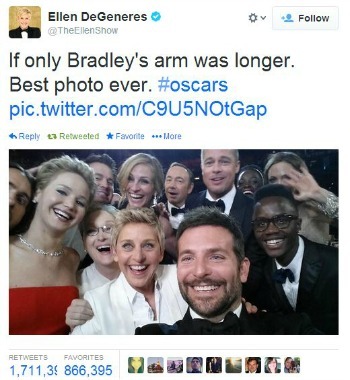 Seriously, Ellen said simply that she wanted to take a photo and wanted people to share it. And that’s what happened. OK who are we kidding? Ellen DeGeneres took a selfie with Meryl Streep, Angelina Jolie, Brad Pitt, Lupita Nyong’o, her brother, Bradley Cooper, Jennifer Lawrence, Julia Roberts, Kevin Spacey, Channing Tatum and Jared Leto while she was hosting the Oscars. It’s the ultimate selfie of all time. Of course that thing went viral. If you can get all those people in one room, take a picture of it and you’ll go viral too.